Over two hundred cheese-makers regularly attended the Little Falls cheese market on Ann St. Most of the cheese factories were located in Herkimer County north of the Mohawk River. Competition was brisk, so the highest prices were often paid. 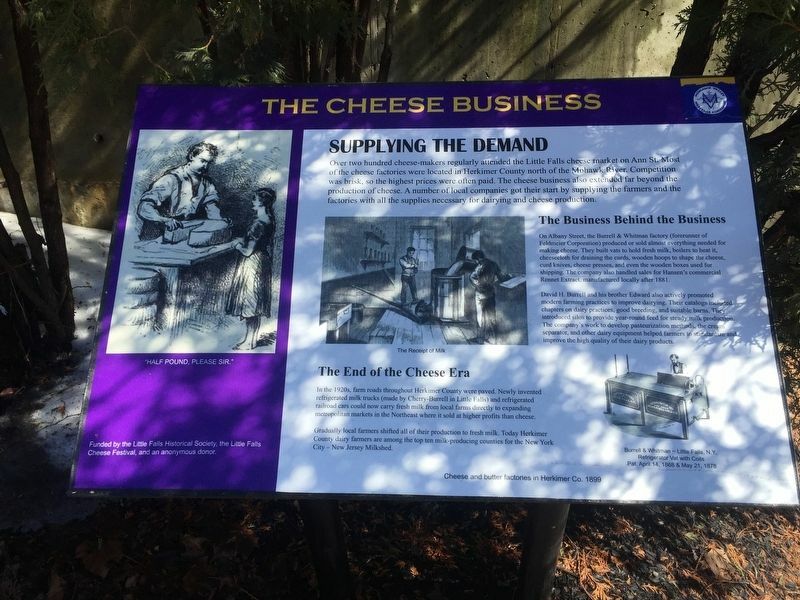 The cheese business also extended far beyond the production of cheese. A number of local companies got their start by supplying the farmers and the factories with all the supplies necessary for dairying and cheese production. On Albany Street, the Burrell & Whitman factory (forerunner of Feldmeier Corporation) produced or sold almost everything needed for making cheese. They built vats to hold fresh milk, boilers to heat it, cheesecloth for draining the curds, wooden hoops to shape the cheese, curd knives, cheese presses, and even the wooden boxes used for shipping. The company also handled sales for Hansen's commercial Rennet Extract, manufactured locally after 1881. David H. Burrell and his brother Edward also actively promoted modern farming practices to improve dairying. Their catalogs included chapters on dairy practices, good breeding, and suitable barns. They introduced silos to provide year-round feed for steady milk production. The company’s work to develop pasteurization methods, cream separator, and other dairy equipment helped farmers to standardize and improve the high quality of their dairy products. In the 1920s, farm roads throughout Herkimer County were paved. Newly invented milk trucks (made by Cherry-Burrell in Little Falls) and refrigerated railroad cars could now carry fresh milk from local farms directly to expanding metropolitan markets in the Northeast where it sold at higher profits than cheese. Erected by Little Falls Historical Society, Little Falls Cheese Festival, and an anonymous donor. Location. 43° 2.541′ N, 74° 51.548′ W. Marker is in Little Falls, New York, in Herkimer County. Marker is at the intersection of South Anne Street and Albany Street, on the right when traveling north on South Anne Street. Touch for map. Marker is in this post office area: Little Falls NY 13365, United States of America. Touch for directions. Other nearby markers. At least 8 other markers are within walking distance of this marker. The World's Best Cheddar (a few steps from this marker); The Street Cheese Market (within shouting distance of this marker); Shaping the City (within shouting distance of this marker); Window on the Past (about 300 feet away, measured in a direct line); Route of the Little Falls Canal (about 500 feet away); A Bridge for Boats (approx. 0.2 miles away); Benton’s Landing (approx. 0.2 miles away); Little Falls (approx. 0.2 miles away). Touch for a list and map of all markers in Little Falls. More. Search the internet for The Cheese Business. Credits. This page was last revised on March 19, 2019. This page originally submitted on March 19, 2019, by Steve Stoessel of Niskayuna, New York. This page has been viewed 93 times since then. Photo 1. submitted on March 19, 2019, by Steve Stoessel of Niskayuna, New York. • Bill Pfingsten was the editor who published this page.